Each year, NAEYC holds a Public Policy Forum to advance federal and state early childhood policy. Participants gather with state teams to network with national and state public policy leaders and fellow advocates, participate in engaging professional development related to the policy issues that affect early childhood education, and meet with Congress to discuss relevant legislation that will affect children. 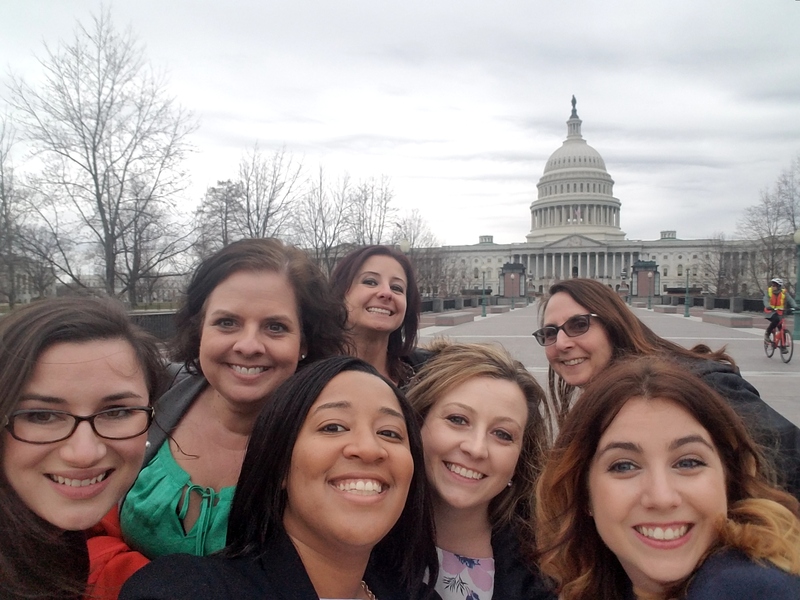 This year, Rhode Island AEYC brought its largest team to date with seven early childhood advocates that are employed in various positions in the field of early childhood education. The team included three members of the RIAEYC staff including myself, executive director Lisa Hildebrand, and Angela Ortiz, as well as Catherine Green, childcare director at The Genesis Center, Martha Donovan, CCRI student mentor and RIAEYC board members, and two members of RIAEYC’s Young Leaders: Danielle Fonseca and Kayla Caron, both of whom are classroom teachers. Our trip began with two full days of training that included a summary of the 2018 electoral landscape, ideas on engaging candidates and increasing voter turnout, a debrief of pending legislation that would affect children including the PACE Act, the Affordable Care Act, CHIP, Immigration policies, and the Higher Education Act. Most notably, we discussed a possible funding increase through the omnibus spending bill and the Sen. Patty Murray’s Child Care for Working Families Act. It was a huge amount of information to digest, but we ended our day on Monday feeling prepared and excited for the day ahead. I turned to find Sen. Sanders himself, in the flesh, wondering what seven women were doing outside his office. We explained that we were visiting on behalf of NAEYC, and he immediately recognized our cause and the relevant legislation. I was so pleasantly surprised by how quickly he recalled the bills that were so important to us. We thanked him for his commitment to improving the lives of young children, and he thanked us for our hard work in the field because, as we all know, children are in our care during the most critical developmental years. This impromptu meeting set the tone for the rest of the morning. Our first appointment was with Senator Sheldon Whitehouse. We were lucky enough to have the Senator sit in on a majority of our meeting. We shared several pieces of artwork from children in Kayla’s class, which he carefully flipped through as we spoke about the importance of high quality education during these critical years. Sen. Whitehouse was in favor of the increased funding, and he cosigned the Child Care for Working Families Act. Our next meeting with Senator Jack Reed’s education staffer was equally successful. We even caught Senator Reed on our way out to have a brief discussion about our agenda. Both Senators voted in favor of the omnibus bill that included the CCDBG funding. Our team split up by district in the afternoon to meet with staffers from our delegation in the House of Representatives, Congressmen Jim Langevin and David Cicilline. We ended the day feeling energized to continue this conversation and spread the word further. Congressman Cicilline even met with members of the early childhood workforce to continue the conversation following our trip. We are grateful to all members of our congressional delegation for the support, but our work is not done! Join RIAEYC as we continue to advocate for high quality early childhood education. You can join us at an upcoming meeting with the Campaign for Quality Child Care.